The growing American interest in India has led to optimism for future cooperation – but significant hurdles remain. After talks had been delayed previously owing to domestic developments in the US, causing much disappointment in India, US Secretary of State Mike Pompeo and Secretary of Defense James Mattis finally arrived in New Delhi last week for meetings with their counterparts in India – Foreign Minister Sushma Swaraj and Minister for Defence Nirmala Sitharaman. This 2+2 dialogue, the first between the two countries, is aimed at strengthening the strategic relationship. The agenda for the talks was outlined in a joint statement, designating India as a “Major Defence Partner” of the US, and a committing to “strengthen defence ties further and promote better defence and security coordination and cooperation”. 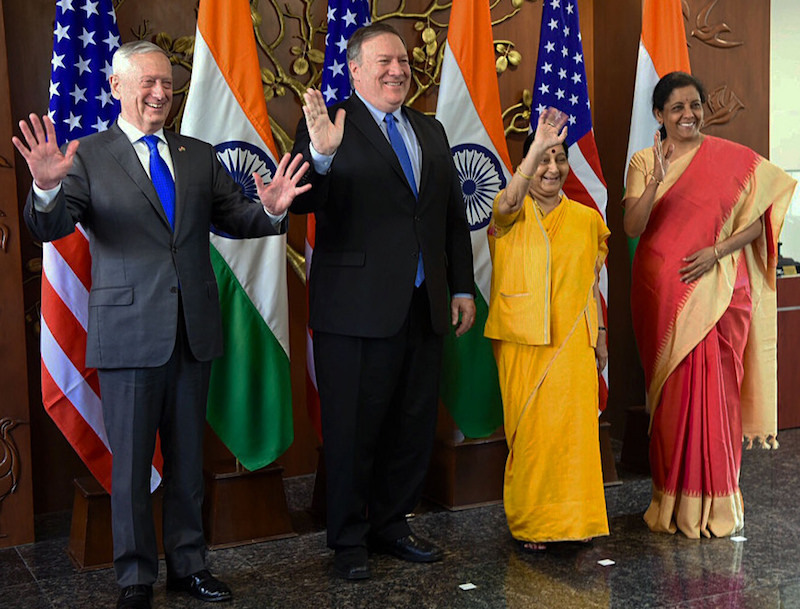 Pompeo also highlighted India’s relevance to the success of the US Indo-Pacific strategy. This followed the noteworthy change of name in May of the US Pacific Command to the new Indo-Pacific Command – a change symbolic of the growing American interest in India. The impetus to the strengthening of the strategic relationship is also reflected in the revival of the Quadrilateral Dialogue between India, US, Japan and Australia. First initiated in 2007, the dialogue failed to take off and was disbanded, but has been reconstituted with meetings in November 2017 and April 2018. Following the US-India meeting in New Delhi, the two countries decided to set up a direct hotline between the foreign and defence ministers. There were also negotiations to support closer defence industry cooperation and collaboration, and steps to increase personnel exchanges between the two militaries, and a discussions of a host of other issues in the relationship. Notwithstanding the recent enthusiasm, there also exist potentially significant spoilers for the partnership. India and the US have signed a Communications, Compatability and Security Agreement, enabling the US to provide India with communications equipment and technology. India had earlier objected to this agreement, concerned with sharing of critical information and its sensitive strategic communications network. Reports of US President Donald Trump’s mimicking the speech of the Indian Prime Minister Narendra Modi, and a frosty meeting between the two in Manila in November last year, present something of a personal hurdle. And at a strategic level, India’s need to balance its interests between the US, China, Russia, as well as maintaining relations with regional partners such as Iran, are also a significant factor. While critical of China at the domestic front, Modi has been reluctant to take a tough line on China at international forums, disappointing many during the Shangri-la summit in June. Outside Asia, the American influence in India’s Iran policy also has been a factor previously and a new set of sanctions penalising India for trade with Iran (as a major source of oil imports for India) could trigger another balancing act. The sanctions with respect to Iranian crude oil will be enforced … and it is our expectation that the purchases of Iranian crude oil will go to zero from every country, or sanctions will be imposed. India could find itself on the end of US sanctions for its ties to Russia too. The US has objected to India’s planned $6 billion purchase of S-400 anti-aircraft missiles from Moscow and called for the deal to be cancelled – a demand India has so far resisted. Despite these obstacles in the relationship, the Indian media was pleased that the talks resulted in pressure on neighbouring Pakistan. The joint statement called for a crackdown on cross-border terrorism, reflecting signs of tension between the US and Pakistan over financial assistance. Despite this, however, Pakistan is crucial to American operations in Afghanistan. While the India-US relationship moves forward, encouraged by the success of the dialogue, particularly from the American perspective, the impact of these spoilers and India’s balancing act is likely to create significant tensions. Trade sanctions will be particularly detrimental to a struggling Indian economy and deterioration of relations with either Russia or Iran could significantly hamper India’s regional position. There is plenty more to talk about.